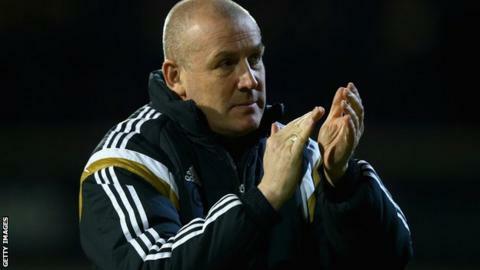 Brentford manager Mark Warburton says he will continue to focus on the job in hand rather than worry about speculation over his future. The Bees said Warburton "will continue to lead the club" following speculation on Tuesday that the 52-year-old would be replaced at the end of the season. The west London club are sixth in the Championship table, having won promotion from League One last season. "The only focus from me is on this squad of players," said Warburton. Speaking to BBC London 94.9 after Tuesday's 2-1 loss at home to Watford, he added: "This team have achieved so much and we don't want this season to peter out. "We have got our targets and we can push forward hard from here." Brentford released a statement on Tuesday after a story in The Times said Warburton would be dismissed by owner Matthew Benham even if the Bees win promotion to the Premier League. The Brentford statement stated that Warburton's "increasing profile within the game" meant that he "will deservedly have turned the heads of other clubs" and that the club "plan for various possible eventualities". The Times reported that Benham and Brentford chairman Cliff Crown held talks with Rayo Vallecano manager Paco Jemez last week and offered him the chance to replace Warburton at the end of the season. "It is a nice compliment and the club are saying that we are catching the eye, which for an inexperienced manager is a real compliment," said Warburton. "Hopefully the statement has put to bed lots of rumours. My only focus is Brentford and the team. Meanwhile, Bees owner Benham posted on Twitter early on Wednesday morning that it had been "a very difficult 24 hours" and that he will "try to explain the situation more in the next couple of days". "I've been a genuine fan since 1979 and try to honestly act in the best long term interests of the club," he tweeted. Before kick-off at Griffin Park on Tuesday Brentford fans sang Warburton's name as he emerged from the tunnel, and the team celebrated Andre Gray's opening goal on the touchline with their boss. "I'm thankful for the many phone calls I received and the outstanding support from the supporters," said Warburton. "It is genuinely appreciated and hopefully the team can keep on delivering the level of performance they have done."